International Academic Conference organized by IAI, University of Bologna and the NATO Allied Command Transformation, on 24th-26th October 2018 in Bertinoro (Forlì). The conference focused on the stability and stabilization of regions important for euro-atlantic security, such as North Africa, Sahel and Middle East, as well as on NATO possible role in this regard – within a broader effort by the international community. The 3-days long conference has been structured in two plenary sessions, opening and closing the event, and three Working Groups. The Working Groups focused respectively on: the metrics of stability in a multidimensional perspective; defence institution building and the challenges of organized crime and illegal migration; instability factors in North Africa and Middle East and counter terrorism. 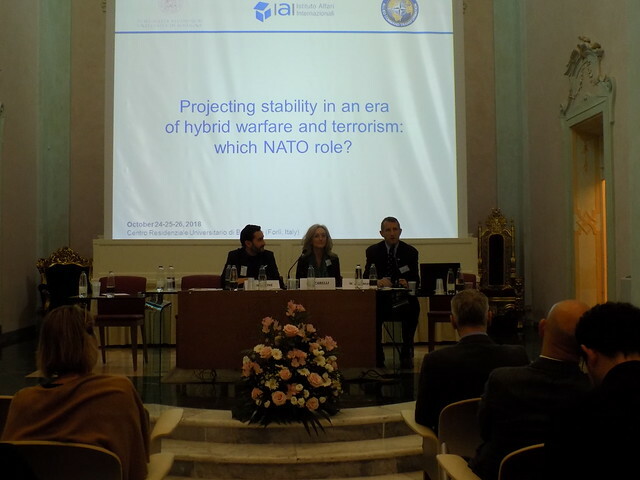 More than 60 representatives from NATO agencies and commands, as well as from OSCE, EU, NGOs, academia and think tanks have participated in the event, which follows a series of Academic Conferences started in 2011 in Bologna. The papers presented during the event and the Working Groups’ Report will be released in an ad hoc publication.